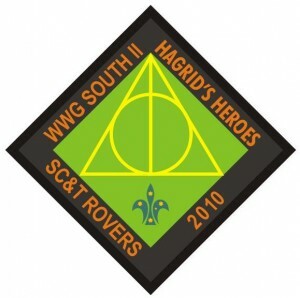 “Hagrid’s Heroes” the second Weekend Wide Game South, ran successfully on the 5-6th June. Based on the attendance of the first event we had been expecting things to be big – but the response was huge for the “little brother” of the SC&T Rovers WWG events. In this Harry Potter-themed game, around 130 Scouts in 27 Patrols took on the role of Hogwarts students resisting (or aiding) the assault of Lord Voldemort. During the game Patrols were faced with Dementor raids, attacks by Death Eaters, and the threat posed by their fellow students. The goal of each side was to discover the seven fragments of Lord Voldemort’s soul – one side attempting to preserve them, the other to destroy them. The game also required Scouts to manufacture their own wands, which served as both weapons and “lives” for their Patrol. Some Scouts rose to this particular challenge, constructing elaborate devices to earn point bonuses. However, they were concerned when told the wands could be taken as trophies by other Patrols – and more than a little worried when informed that Death Eaters would SNAP wands taken from Patrols they caught! Patrols could join the Order of the Phoenix or the Death Eaters, earning marks of the Phoenix or the Dark Mark respectively. There was a giant spider’s web to raid, broomsticks to ride, and the opportunity to duel Lord Voldemort himself. With recent storms in everyone’s mind, many a weather-eye was turned skyward over the weekend. Fortunately, the worst suffered by our Scouts was a few mild showers. Of more immediate threat were the resident grass ticks – our first aid team were kept very busy dealing with the onslaught! The Narooma patrol who lead an altogether too-trusting “Harriet Potter” into a Death Eater ambush. The patrol bearing the Dark Mark who then attempted to double-cross their master and take out Voldemort himself. The multiple Patrols who attacked the lair of the Death Eaters, forcing the “unbeatable” defenders some serious difficulties. The Venturers, Rovers and Leaders filled the other various game roles with (a sometimes worrying) enthusiasm. As always, the Venturers performed the “Dementor death squad” roles with aplomb, whilst those required to fill the Harry Potter and Voldemort roles took altogether too much pride in their work. Although surprisingly, a decent percentage of the Death Eaters proved too soft-hearted to destroy the wand creations of their victims and instead chose to confiscate them (to be retuned at game end). The WWG team remain greatly impressed by the assistance provided by the various Venturers, Rovers, Adults, and Leaders who assisted on the weekend – this event would not be able to function without this help, and each year we are grateful for the service provided. Special thanks go to the Units and Crews who provided the (enthusiastic) “Bad guys” for the weekend: Austinmer, Black Range, Bomaderry, Bungendore, Central Oak Flats, Cobargo, Figtree, Illaroo, Keiraville, Korrahill, Queanbeyan, Thirroul/Bulli, and Warilla. A final special thanks go to the Potato Point RFS who loaned us the use of their facilities, and Snowgum, who sponsored the event and provided extra prizes. We’ll see you all at Cataract in November!